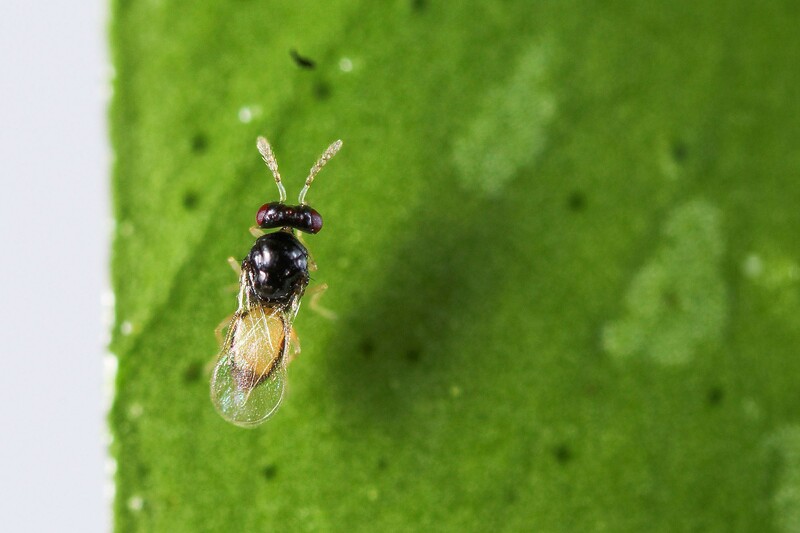 The hunter: Tamarixia radiata, the small wasp that lays its eggs on Asian citrus psyllid nymphs. The hunted: An adult Asian citrus psyllid and a nymph on a citrus tree. The insect carries bacteria that cause citrus greening disease. The goal: Wasp eggs hatch and eat the nymphs from the inside, killing them and leaving a distinctive bore hole. WASHINGTON – Every week for the past year, researchers in Riverside, Calif., have overnighted an insulated box of glass vials, filled with honey and hundreds of tiny wasps the size of a grain of sand, to a facility in Yuma. There, the wasps are released by the thousands to do what evolution has perfected them to do – kill the Asian citrus psyllid. The wasps may be small, but their impact could be huge – researchers and farmers hope the wasp can halt the spread of a disease carried by the Asian citrus psyllid. That disease, citrus greening disease, has devastated Florida’s citrus industry and led to citrus quarantines in large parts of western Arizona. The wasps – Tamarixia radiata – have been used effectively in California and for the past year they have been released every week, 1,600 at a time, at eight sites in Yuma. 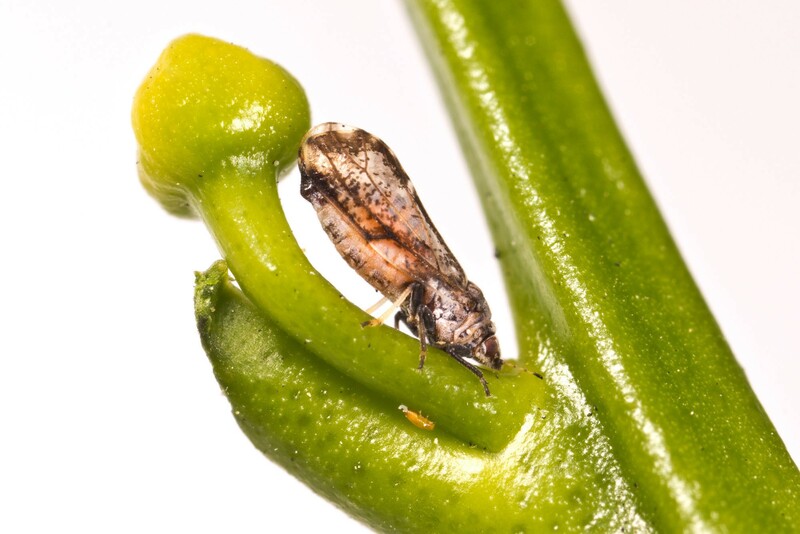 As federal researchers enter the second half of a two-year experiment, they plan to expand the releases to 16 more locations in Arizona that are infested with the Asian citrus psyllid. 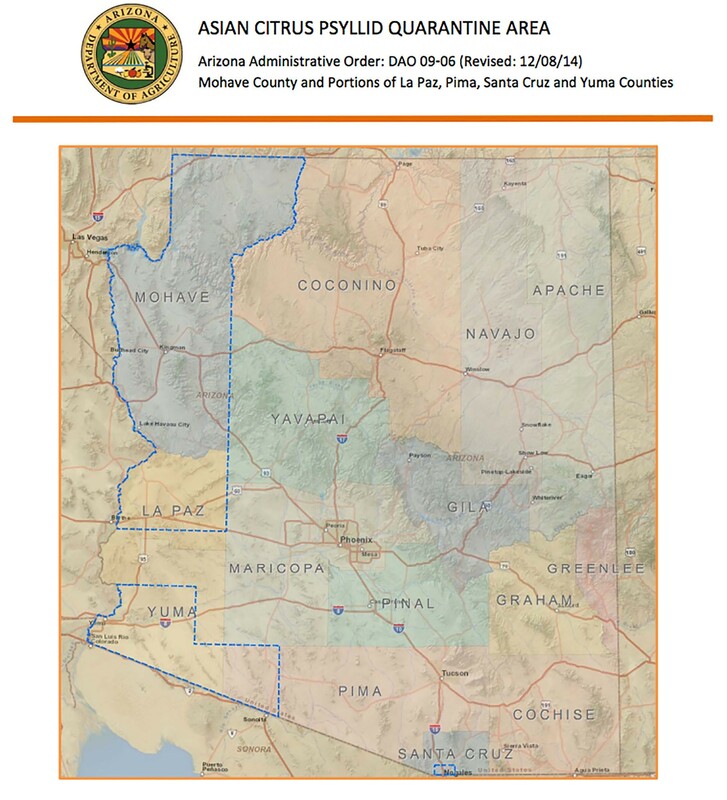 “We have every intention to make sure that citrus greening disease doesn’t take hold in this state, so that we can have viable commercial and residential citrus production in this state for many years to come,” said John Caravetta, associate director for the Arizona Department of Agriculture. Citrus greening disease was discovered in the U.S. in Florida in 2005. The disease has since wiped out roughly half of Florida’s citrus production. The bacteria that cause the disease create uneven growth of citrus trees and their fruit, giving a bad taste to the fruit and eventually killing the tree. The Asian citrus psyllid was discovered in Yuma in 2009. 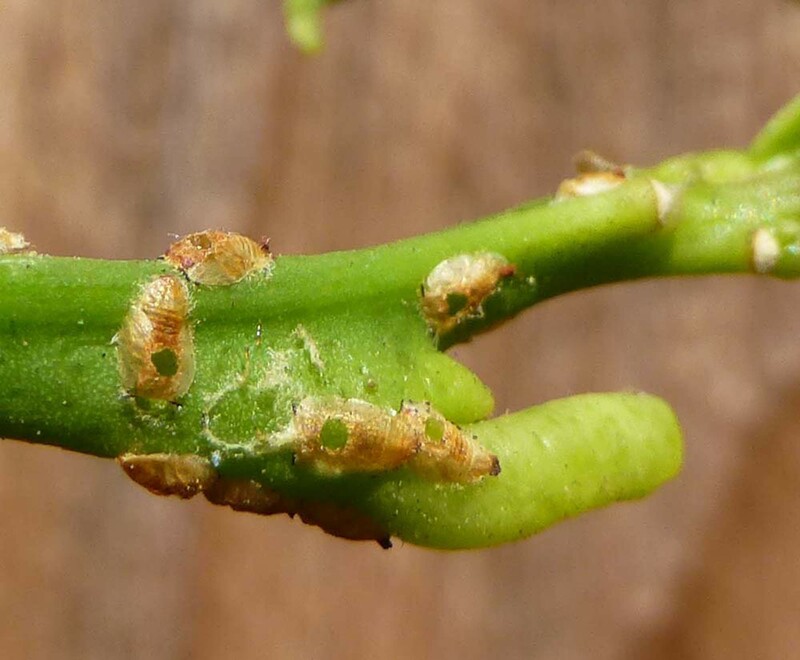 The disease has not been found in Arizona, but citrus producers fear the Asian citrus psyllid could bring the disease here and potentially destroy the state’s $36 million citrus industry. 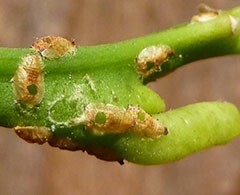 The 2009 discovery of the pest let to a quarantine of residential and commercial citrus growers in part of Yuma County. The quarantine area has grown as new pockets of the insect were found, and now includes all of Mohave County and parts of Yuma, La Paz, Pima and Santa Cruz counties. Under quarantine regulations, commercial citrus growers must take extra precautions to wash fruit and spray trees thoroughly with insecticides before they are shipped out of the quarantine area. It can be a costly process. Stacey and Mark Loghry said they understand the need for the quarantine, but have invested “close to $1 million” in structures and chemicals to meet its requirements at Sunset Nursery Inc., which they own and operate in Yuma. When the quarantine was first put in place in 2009, the fourth-generation, family-run nursery had to begin plowing trees under because they were not allowed to ship them outside of the quarantine zone for about 18 months. It is too early to tell if the wasps will take hold in Arizona, but successful wasp colonies could be crucial in helping slow the spread of the insects, said one U.S. Department of Agriculture official who is helping coordinate the research. The use of wasps could become especially important in residential areas where backyard citrus growers don’t actively try and eradicate the Asian citrus psyllid pest. “Because it’s a specialist enemy, it can help a lot with the control of the pest, helping to reduce the numbers,” Simmons said. The USDA announced $30 million in funding this week for research aimed at combating citrus greening disease and the insect that spreads it. Stacey Loghry said she is optimistic about the research being done to stop citrus greening. She is confident that she and her husband will be able to pass the nursery down to their three sons. “I do feel like they’re going to figure out a way to get through this,” she said. A quarantine on citrus products began in Yuma in 2009 after discovery of an insect that spreads citrus greening disease. 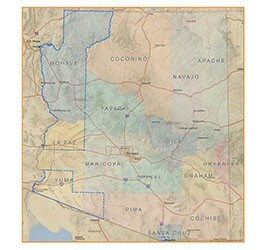 The quarantine - outlined in blue here - has since expande to all of Mohave and parts of Yuma, La Paz, Pima and Santa Cruz counties.